So something had to be done, after looking at various options I decided to go for a plain fibreglass dashboard as used in the current R6 model. However I needed a few alterations the R6 is designed to have a small binnacle behind the steering wheel for the dials which doesn't exist on the Cat and the fibreglass had to be strong enough to self support as there wasn't going to be anything behind it. I had Tiger lay up extra matting on the back of the dash before I picked it up. All I had to do was decide on the design for it. Well after some thought the new one looks almost the same as before but then I couldn't work out a better sequence for the dials and the switches are slightly better placed for using. The other big change behind the scenes is the entire dash is now fed by multi-plugs so it can be detached from the car fairly quickly if required. As the new dashboard was designed to be removed from the car then it was an easy job to build it in the warmth of the house rather than the cold of the garage in december. The basic holes for the dials were easily cut with hole saws and a pillar drill with the hole for the switchgear made from a small hole saw and a jigsaw. A new plate for the switchgear was obtained along with new switches. 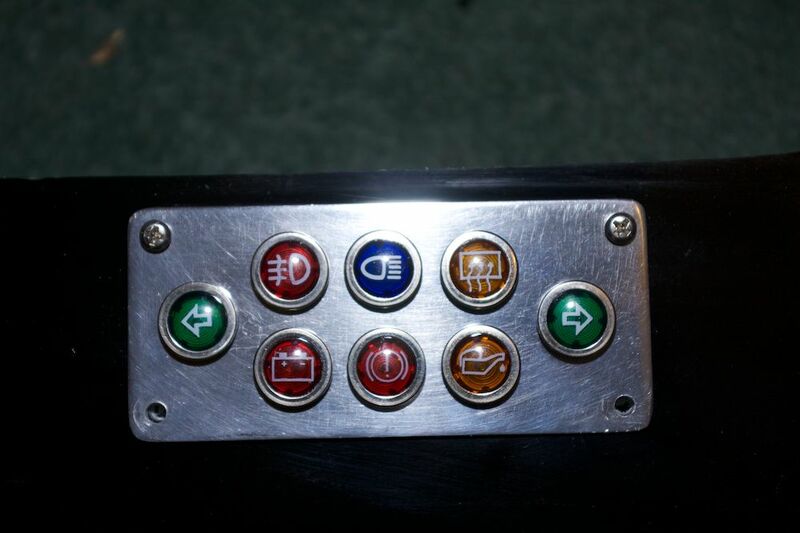 For the warning lamps I had a panel made up to hold all the lights in position going for a slightly unusual order but I like it. The panel was made and polished to look good against the black fibreglass - I had thought of spraying it black but am glad that I decided not to. 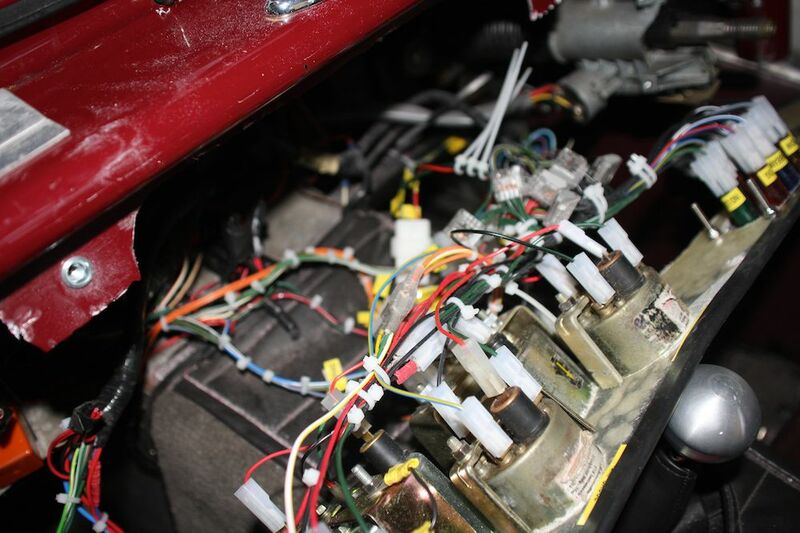 The most complex part of the job - as I was using mulitplugs I dramatically reduced the number of connections from the car to the dashboard from 45 (approx) to 22 this was mainly by losing earths, power feeds, and warning lamp wiring. Although I could have loop wired a lot of instruments together I bought a couple of packs of common blocks to make the connections. There is only one problem with this connector it is designed for solid cable not stranded but can be made to work with a little effort. 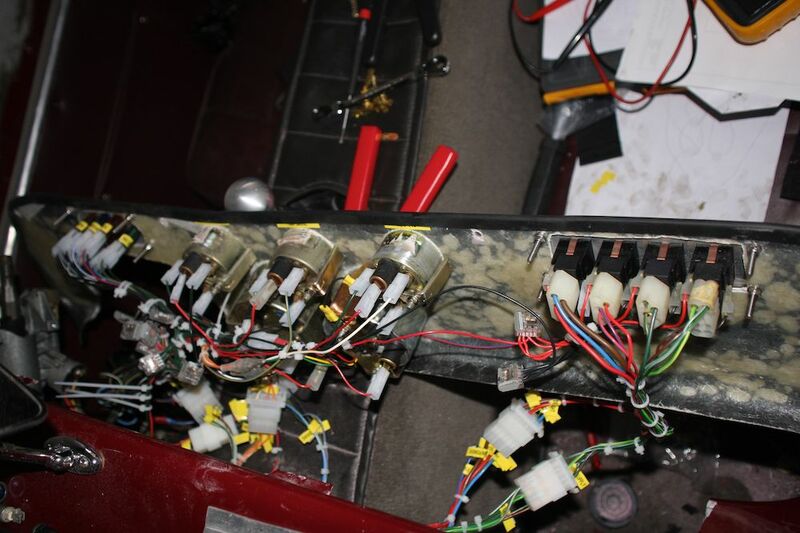 All of the other wiring came from Vehicle Wiring products. There were some extras added to the loom at this point - the electrically headed screen on my car has now gained an operation light so I know it is turned on. 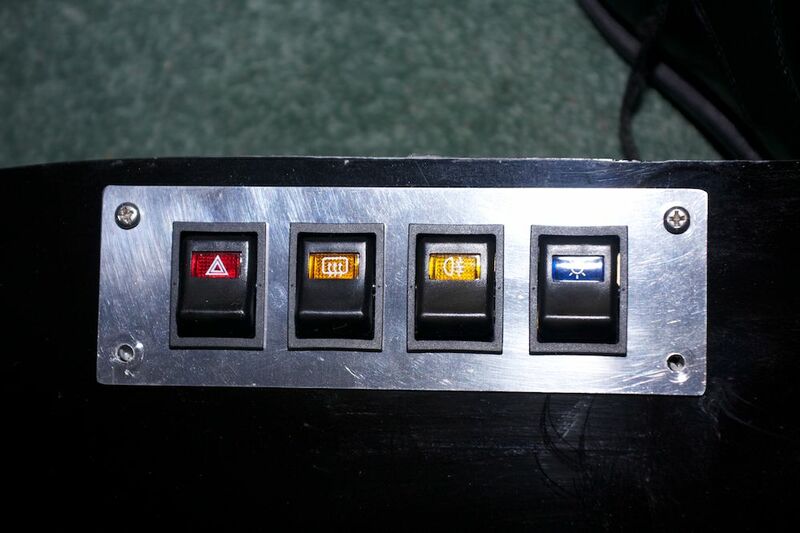 Also I have added a fog lamp light to the dashboard so that I can see that is operational - this also allows the switch to remain lit at night so you can find it. Also to save on wiring the light switch on the dash directly powers up all the warning lamps rather than taking wiring back to the car and then onto the dash again. 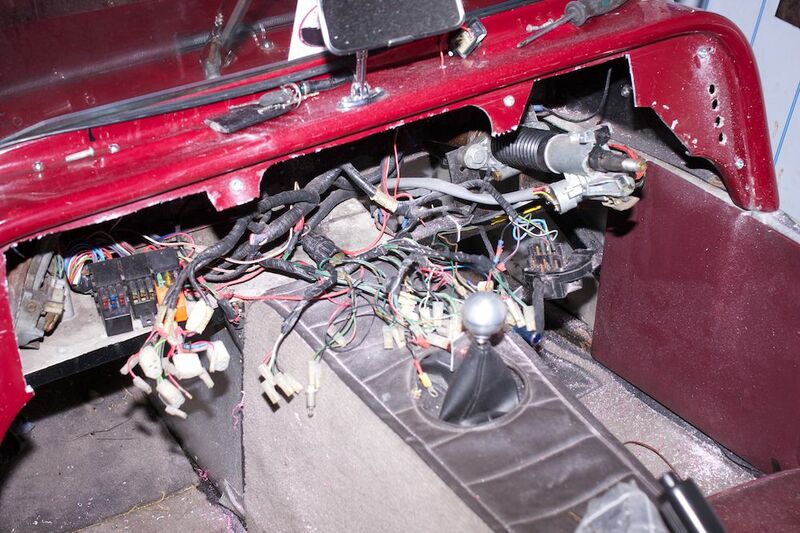 After taking the old dash out you are left with a problem - none of the holes line up with the new one... There is only one course of action drill out the old panel. So having decided where the mounting holes were going and leaving tabs behind for the screws the rest of the original plate was removed leaving the gaping hole seem in the pictures. The mounting holes were then drilled and rivnuts inserted. Now I was sure everything was going to fit it started getting interesting. All the old wiring was stripped down and replaced with the multiplug connections. 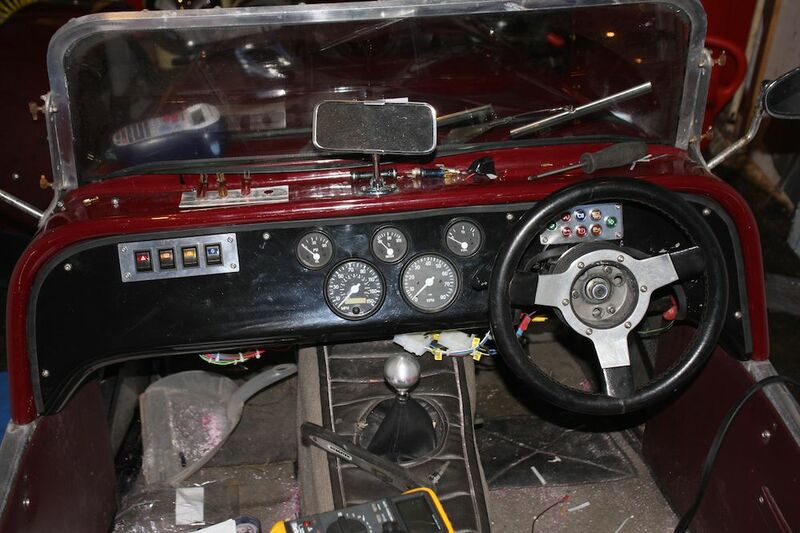 The dashboard was then connected up and all the lights were tested for operation before final fitting. A rubber edge strip was fitted round the top of the dash to conceal where the old and new met as the two mouldings weren't exactly the same. And there we have it - a shiny new dashboard ready to be used (and everything did work the first time - which shocked me).